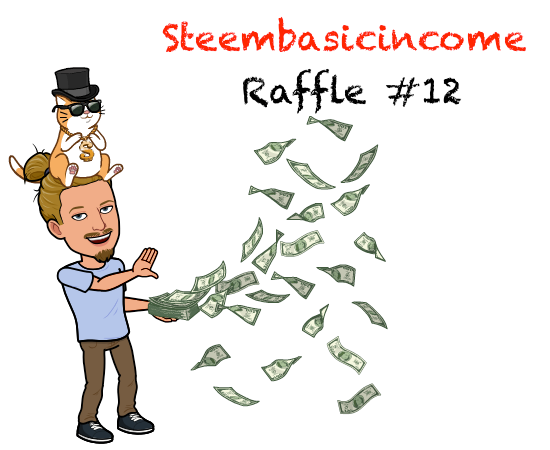 Steem Basic Income 72h Raffle #12 (win lifetime upvotes on all your posts) / Increased Prize-pool!!! We hit 11 valid entries, 11 upvotes and 4 resteems (adding up to 26 raffletickets). Congratulations to @hlezama and @ericfarmer for being our last lucky raffle winners: Steem Basic Income 48h Raffle #11. Keep resteeming and inviting your friends! For this time I will raffle out 2 SBI shares! Steem Basic Income is a social experiment to bring a basic income to as many Steemians as possible. Members join by sponsoring others into the program. Steem Basic Income is delivered through providing regular upvotes to member content. In case you do not know about @steembasic income already make sure to read Their Complete Overview Post. This giveaway will be open for 72 hours. Basically comment whatever you want just simply tell us an interesting story, a joke, talk about basic income,... What ever you wanna talk about (just keep it civilized)! What you write does not change in any way your chances to win I just want people to engage, so I will reserve me the right to exclude spam comments from the raffle! All valid entries receive one ticket in the raffle. In case you also resteemed this post you will receive a second ticket in the raffle. In 72 hours two lucky winners will get randomly picked and sponsored one Steem Basic Income Share worth 1 STEEM each (winners will be announced in the next raffle post)! Q. Why did the Private Steembasic die? A. His buddy forgot to say "Steembasic, incoming"
Did you hear the Pope just cannonised the latest Saint? Happy that you support sbi. Its a good test ground for real basic income - but here users have to work (write posts) to get some. Even better! Thanks! Yeah I do too support basic income in general. Just love the concept behind it. Like you said love the fact this is still tied to work (producing quality content) here on Steemit. Thanks for putting this together. Good luck everyone! Thanks for the free SBI shares @elleok. Don't need to enter me in this contest. I just wanted to let you know I appreciate it. I am trying to do whatever I can to do well on Steemit long term. Yeah I know starting out on Steemit can be quite hard. I see you took a pretty long break of steemit. Just keep on writing quality content and your Steem Power will rise in no time. I hope I'm lucky, because I need it. I hope I'm competing, folks. What an interesting game. I hope I'm one of the winners. I congratulate them on their initiative. A good way to help those of us starting out. Thank you. Thank you. Keep your head up. Maybe the luck is in your favor this time! here's my entry and it's a question. it's been 8 days but i don't think i had any reward as the last lucky winner of Steem Basic Income 72h Raffle #10.
i'm just curious about this SBI thing. can you please give me a short info about it? I checked your posts and saw you are in the sbi8 pool and therefor will receive a daily upvote from sbi8 forever. so 1SBI mean daily upvote from a user forever? It's not really a user its an account managed by the @steembacisincome group. You own one share and the value of this daily upvote is determined by the number of shares you own. now it's more clear to me. I just learnt about steembasicincome, it's a great concept I must say. Well i found your post from a resteem from @fitfun and i wish my upvote was worth more. My delegated power is no longer with me but im going to keep trucking on 💜 . So im a local crafter from Hawaii, i moved to Florida last year to try and build a better lufe for my younest son and i. So far its been a crazy journey. We have really seen so much more then what we know. Life outside of the islands is very different and at times strange. Like driving for hours and hours to get somewhere 🤣. In hawaii you dont normally drive more then a hour or two to get anywhere. So were learning that you have to bring along lots to do while on a road trip.. Anyone else ever feel lost and out of place? Like people look at us differently i guess because were not what they think we are. Idk all i can say is cultural shock is very real here. Roses are Red, Violets are Blue, and SBI is made just for you! I like your making it rain money graphic. Did you do it yourself? Thanks! Nah its from a free to use app actually, called: Bitmoji. Despite it being out quite a long time I first heard of it a few weeks back and really love the app. You are able to personalize your own avatar and they have a ton of different picture you can choose from with your personalized avatar in them. The rest is just a simple paintbrush job. This post has received a 11.54 % upvote from @booster thanks to: @elleok. This post has received a 20.46 % upvote from @boomerang. You can't win if don't enter! cool giveaway @elleok! I'll try my luck. Thanks! what do you call an Alligator with a VEST ? Hahaha im glad you like it! Thanks! New to this but I like the idea so count me in. Yep I really love the basic income vision! Checking your profile I saw you got a bunch of SBD lying around. I would recommend you reading into how to promote your post with bidbots. Just take this post for an example I'm doing this raffle pretty much every 3 days and if you chekc the last raffle with nearly no promotion I only had 11 valid entries to the raffle. Just search for some guides on how to promote post with bidbots. I'm pretty sure there are enough good guides out there. Steem Basic Income sounds like a cool initiative. I'm still trying to understand what and how it works. Thanks for putting this together! This is quite an intresting draw, is a form of contributing your own quota to the goals of the steembasicincome. Keep up the good work. Just love the vision behind the @steembasicincome project and basic income in general! First, am kind of curious, after 49 minutes of posting why aren't you having any @sbi upvote on your post. You should be having one by now. Today is Sunday, the priest talks about the great shepherd, Jesus, he made a statement about being a shepherd, and being a dhepherd takes a lots pf precautions, which is always preaching the Love of God to His people. I'm enrolled in the newest pool sbi7 where they test the system with only one upvote a day. I have been told they will change all the pools to only one vote a day in the future since it is easier to handle the sheer amount of upvotes the bot has to handle and will result in a more consistent and fair upvote distribution. A very exciting and good competition.For long I have been trying to find myself with a membership of the steem basic income but the finances give up.may be it's my chance this time. OK, I'm in, I really like SBI. Really cool you both dreamed of it. Yeah it is really sad to see the common people suffer that much only due to the massive faults of the countries leadership. Really hoped this will change after the elections since I never saw him winning again (actually I still believe this election was a scam to be honest). Wish you all the best luck! Compassion, honesty and hard work will pay of eventually. What do you call a snake with no scales? Uhmm... I don't know what to say. Here's a joke for you; did you hear about the guy who invented knock knock jokes? He won the no bell prize. What do you call a cat that gets anything it wants? When I am put on the spot to come up with some interesting fact, I often draw a blank which, in itself is an interesting fact. I really like the concept of SBI, it is a great tool for us minnows. Yeah I'm really a basic income supporter in general and of course here specifically with @steembasicincome. It is a really great tool for everybody with fair distribution no matter if you are a minnow or a whale. Resteemed and upvoted. Let's see if I am lucky. Thanks for the opportunity. No idea about Steem Basic Income and seeing that I have been delaying for last several weeks to look it up, I'll be doing that asap. You should really check it out just a awesome vision! Just check the @steembasicincome blog or join their discord channel to inform you. Nice giveaway idea! it helps genuinely motivated people without catering to users who don't care about putting in the effort, every little thing matters. SBI is doing great things and I found it cause someone I don't know at all put me in it. That was a lucky day for me I think. Thanks for setting up this raffle. Hello @elleok, Steemit, it is a commercial opportunity for all of us in this big fish tank, I dedicate half the working time, because I have other professional responsibilities. I like competitions, so I think it's a way of interacting with other people. Good luck to me and to everyone! Upvoted .. thanks for the contest. Trading votes beats SBI in many cases. If you see it short term of course but long term that is just not the case. For anyone being sponsored, it is a great deal. Extra votes at zero cost! Can't complain there, regardless of how small the vote is. For those doing the sponsoring, it will take at least a year to recover your initial investment; after that, you will also get free votes, so yes, you are correct that long-term does have a pay-back. Factoring in what losses you may have had by not having the steem power for the year that was used to purchase the initial investment is rather difficult because of all the variables; only time will tell. I have to admit that it was a brilliant idea. I've been on sbi since late December when I got a share given to me. Since then, I have given many away and had many given to me or I have won them. I really love this program and your idea for a raffle. I am stepping up my game to get more of these dependable votes. They really help me in both motivation and rewards. Upvoted and resteemed. Thank you! I am aiming to eventually get 100 shares of SBI - after that I will focus on building my own SP before leveraging more. unicorns are real. I love unicorns.